Mysterious through the glass of a display window at American Museum of Radio and Electricity. One can barely make it out, but it's a stationary bicycle hooked to a generator. It can power amplifiers for concerts. There's the reflection in the window of another bicycle parked behind me. Also my reflection in the window. More information on the power wheel at Makeshiftproject.com according to the sign. A vendor at the Bellingham Farmer's Market has bicycle powered blenders for smoothies. I tried it last week even though I don't normally drink smoothies. 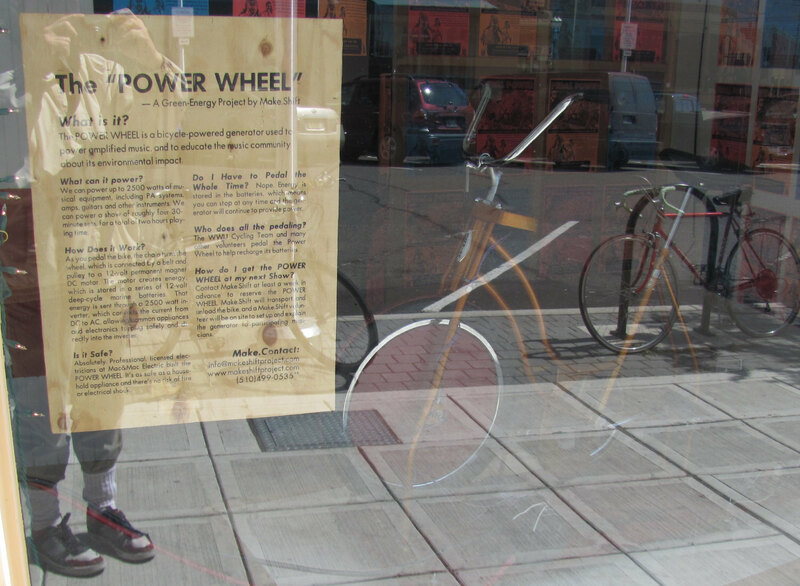 Bicycle powered appliances may not save that much energy in the great scheme of things, but they can be good publicity. In the home, heating and air conditioning are usually the big energy hogs. On the road, it's motorized transportation and bicycles do help there. On the other end of the spectrum, I remember some people who went camping in a large RV. Everything in their RV was "power this power that." Power windows, power steering; even the can opener. They couldn't open a can without starting up a gas powered generator. Ha ha! I walk almost everywhere these days, with the occasional bus ride. I am so glad that I got rid of my car 15 years ago.